A ‘swale’, or ditch, is a shallow depression in the ground, designed to collect or redirect water. 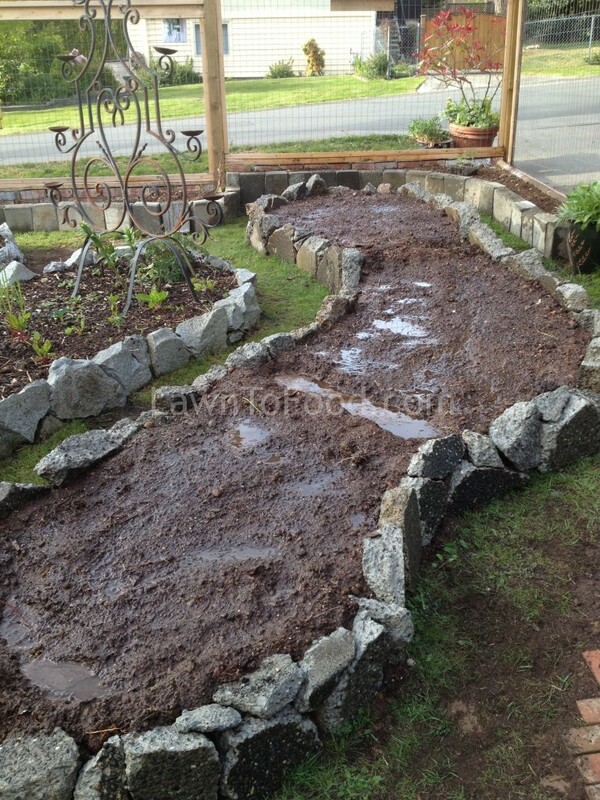 Swales, in permaculture, are used to mimic the water-collecting and water-holding abilities of a thick forest mulch. Swales have been used for centuries by humans to hold, move and manage water. This principle can be used in our yards, on a smaller scale, to hold water that would otherwise run off without soaking into the soil. Especially on sloped ground, swales are very useful for gathering water and making it more available for thirsty plants. Conversely, swales can redirect excess water to where it is needed. This is one of my swale projects in our front yard vegetable garden. 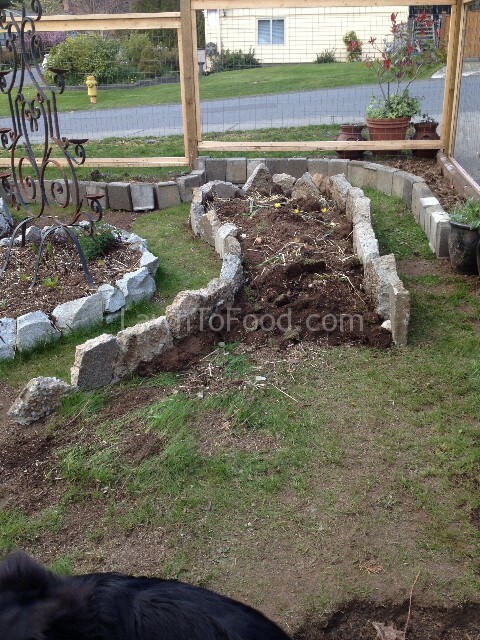 When building this raised bed, I quickly realized that it was going to be sloped much more than the other beds in our garden. This was especially evident when I tried to wet down the dry soil that I was using to fill the bed. The water just streamed off the top towards the house, taking a layer of soil with it, leaving the remainder bone dry. 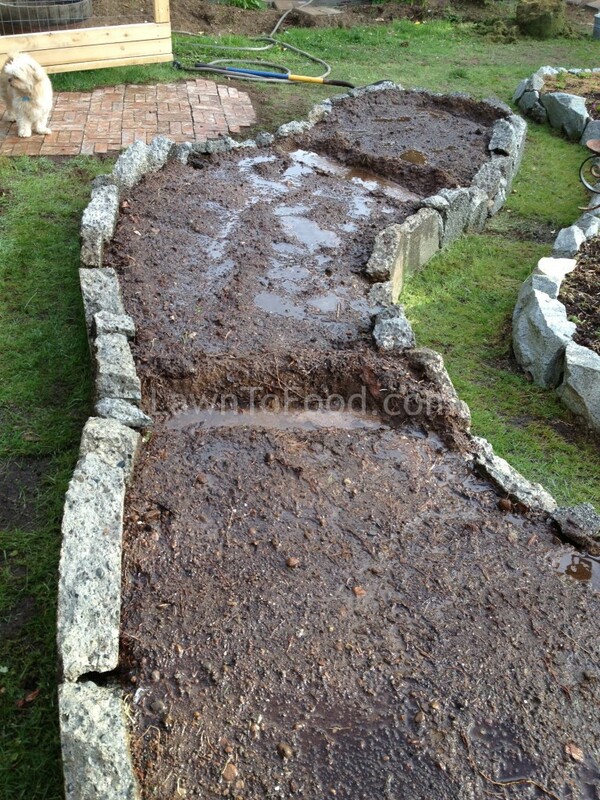 To combat the rolling water, I dug two shallow swales to hold pools water in the garden, allowing it time to soak in. I also plugged cracks in the urbanite walls with pebbles, moss and debris to further prevent water from running out of the raised garden. It was just like being a kid again, playing in the mud and making puddles. Only this time, the puddles have purpose. 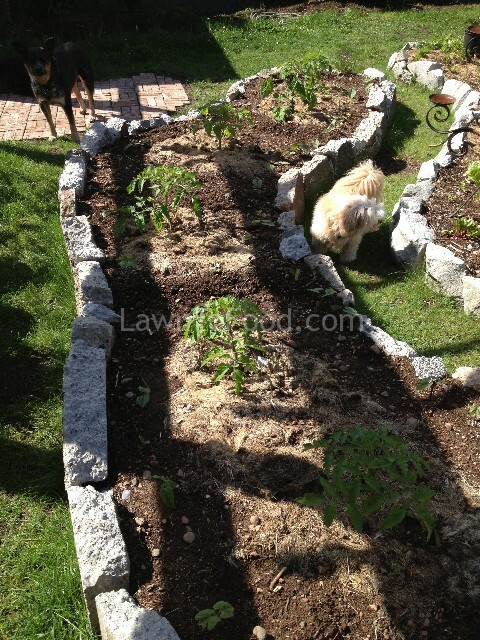 Below, is a picture of the same raised bed from the high side, looking down slope. Mission accomplished! The swales are working very well to hold water in the garden, allowing it time to soak into the soil and not be eroded away. The next thing I did was add a few stones and small chunks of wood into the swale ditches. The large particles in the swale will prevent soil from filling the ditches, causing them to stop working. I topped the loosely filled swales with a twigs and straw mulch. I planted the bed with 6 tomatoes and surrounded those with a nourishing, nitrogen producing bean crop. On the right side of the garden are Burgundy bush beans and on the left, Yellow Wax bush beans. I have also added a top layer of sawdust shaving mulch to help prevent water evaporation and weeds from popping up. Today, the soil is uniformly moist from the swales’ moisture-holding abilities. There is no evidence of water run off, or soil erosion, even after very heavy rain falls. The tomatoes are exploding with flowers and I am looking forward to harvesting their plump fruits in a few weeks. 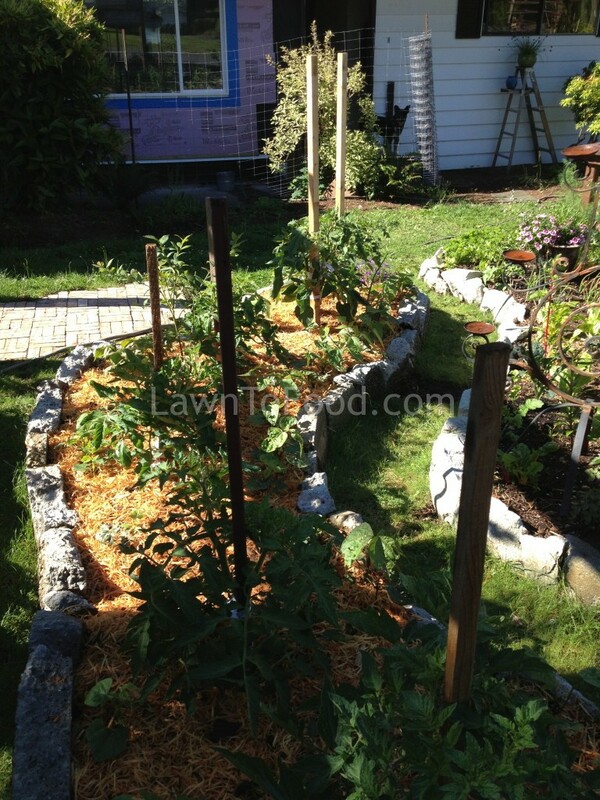 This entry was posted in Containers & Small Spaces, Cool Carpentry Ideas, Crop Planning, Projects, Recycle Reuse Rebuild, Weeds & Mulch and tagged conservation, permaculture, water by Lynda. Bookmark the permalink.